Island communities are seeing a payoff from an effort to better promote the area and reach out to tourists outside of New Jersey, achieving the highest-ever amount of tourism revenue in 2015. Tourism for Ocean County was up 5 percent in 2015, said Dana Lancellotti, director of the county’s Division of Business Development and Tourism. The county’s tourism industry generated $4.58 billion last year, compared to $4.3 billion in 2014. In 2013, the summer after Superstorm Sandy struck the region, spending dwindled to $4.1 billion. Tourism revenue has grown each year since the storm, and has now eclipsed the pre-Sandy total of $4.2 billion in 2012. As a whole, Shore tourism grew up 8 percent last year, according to the New Jersey Division of Travel and Tourism. Though the state report cited lower fuel prices and the decreasing memory of Sandy as reasons behind the jump, local officials say they are now casting a wider, farther net in search for potential visitors. Lancellotti said she has been traveling to numerous travel shows both north and south of the Garden State. Seaside Heights Borough Administrator Christopher Vaz has, himself, manned an information booth at travel shows in Boston and New York. In 2015, beach badge sales increased in Seaside Heights and Lavallette, with the latter setting a beach revenue record. Seaside Heights is now seeking approval for a land swap that would lead to an expanded Casino Pier with more thrill rides. The borough has been working steadily to transform into a more family-friendly resort. 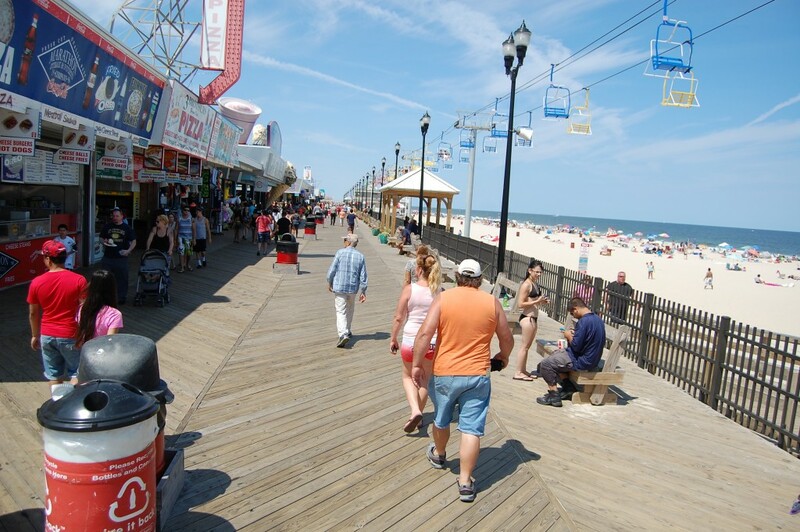 The quickest-growing market for Shore tourism has been from outside the United States – specifically, the Canadian province of Quebec, where Ocean County is focusing advertising dollars to promote beaches and other attractions that are a shorter drive from Canada than the Outer Banks of North Carolina, a long-popular tourist destination. Lancellotti said analytics from the county’s tourism website show that outside of New Jersey, Quebec residents make up the highest number of website hits. The county has also, through Joint Base McGuire-Dix-Lakehurst, been reaching out to military families both at the local base as well as those within a three-hour drive. Statewide, Ocean County is third in tourism revenue generation, next to Atlantic County and Cape May County. Atlantic County, long the state’s tourism leader due to casino gambling revenue, lost 5 percent of its revenue last year, and generated $6.7 billion in revenue. Cape May County generated $6 billion. “They’re not much higher than us at this point,” and we’re progressively going up, Lancellotti said. The county – and local towns – have focused heavily on online advertising to reach out-of-state residents through targeting. “We know who to focus in on,” Freeholder Joseph Vicari said. The number one attraction of Ocean County – its beaches, of course.